Looking for a sweet way to show your gratitude? You've found the ultimate reward with a Chocolate Almonds & Sea Salt Caramels in Red Magnetic Box. Dimensions: 7 3/8" x 3 7/8" x 2 1/4"
Price includes imprint foil-stamped in gold on gift box. 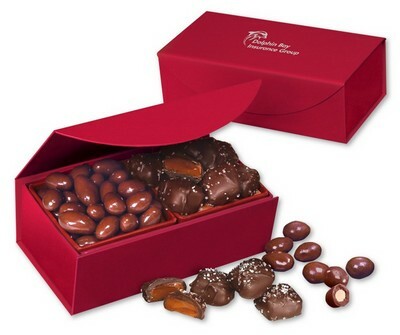 Two of our most popular chocolates in a reusable, deep red magnetic-closure gift box. Six-ounces of chocolate almonds, one of nature’s most healthy snacks, are paired with a quarter-pound of sea salt caramels—soft, buttery caramel enrobed in rich, dark chocolate, then dusted with sea salt to create a bold flavor sensation. Your logo is foil-stamped in gold or silver.